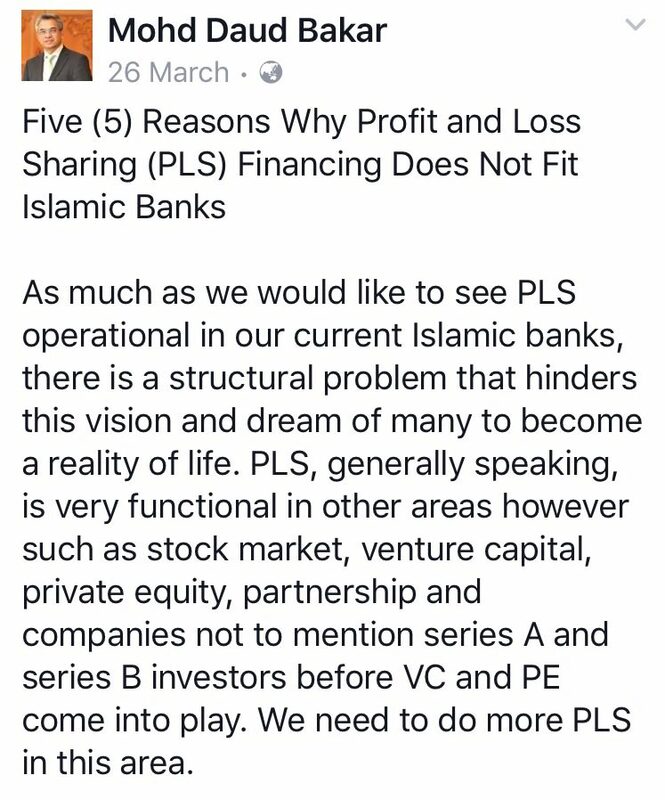 Well, it was meant to be a comment by Dr Daud Bakar on his view on the suitability of Islamic banks to undertake the role of providing Profit Loss Sharing (PLS) financing to customers. I thought it is consistent with what most would have understood when talking about Islamic products structures. PLS structures (I usually use “Equity-based financing” or “Participative structures”) means that a Bank considers the financing that it gives is more than just “debt” but instead as “equity”, or “share” in the company. Higher risks, Higher returns. With equity, the Bank undertakes bigger risks in the business to “earn” a bigger share in the returns. The Bank is also open to potential losses, and such losses is borne by the Bank (and all equity participants). 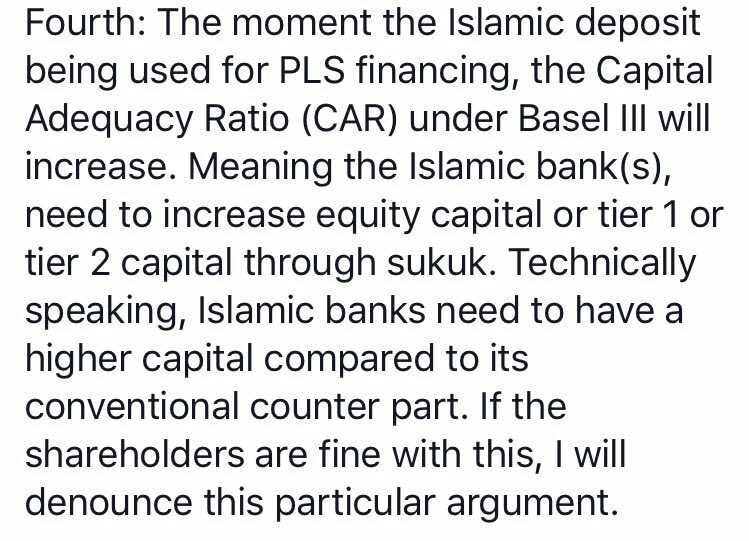 I sincerely believe this is what everyone had understood, and why the equity-based financing structures such as Mudarabah, Musyarakah, Istisna’, Pure Ijarah and Wakalah Fi Istihmar has not taken off in the Islamic banking industry. Comments that Dr Daud should not have made such statements. I was surprised to see some reaction from practitioners and colleagues of Shariah background commenting that this statement is inappropriately made. Especially comments on when BNM is pushing for the development of these products via the various Policy Documents issued, the Chairman of the SAC is making comments that these financing structures are unsuitable for Islamic Banks. His perspective. Dr Daud is not commenting without experience. He is one of the early contributors to the industry and where his understanding as both scholar and practitioner puts him in good stead to make such statements. I was asked by friends to comment on his statements on this website, but I had put it off because I didn’t think it was necessary, especially when I myself agree. Now I feel I have to put in my thoughts as well, someone asked me again recently on this same issue. 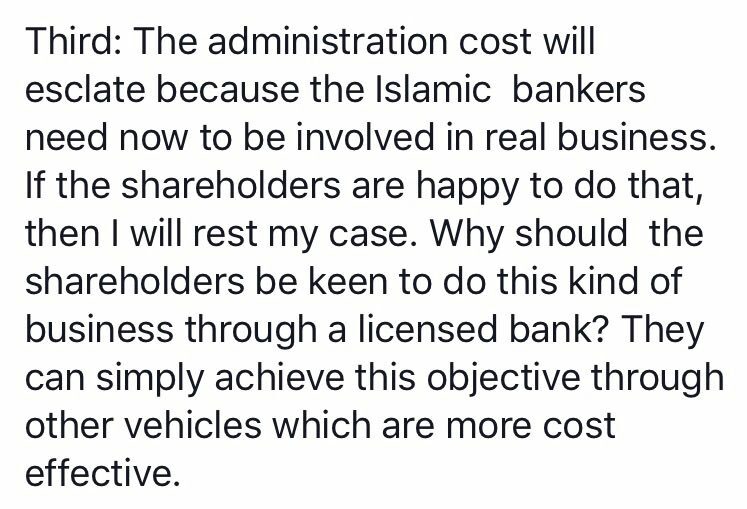 Here is my take on Islamic Banks SHOULD NOT offer PLS/Equity Financing. 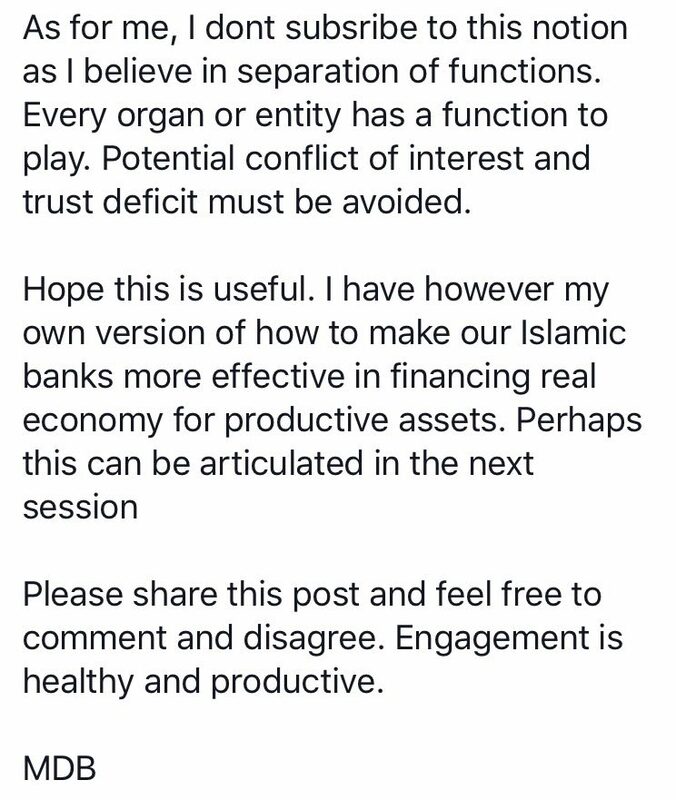 The approach I will take will be based on the comments directly by Dr Daud, where I included the actual screenshots from the FB posting made by Dr Daud in which he outline 5 reasons why banks (including conventional banks) should avoid these PLS structures. In that way, there should not be any ambiguity on what has been written by Dr Daud. And my aim is not to discredit any parties, but to dissect my understanding on the subject as a product developer living in a bank offering Islamic Banking products and services. This is not a new discussion. But before that, I would also like to bring my earlier writings on similar topics which you can find in this website. It is also important to understand the difference between “Equity-based” and “Debt-based” structures. The point that the industry wanted to achieve was that eventually the industry is expected to offer more “Equity-based” products as it promotes a more “Islamic” structure where risks and returns are shared. Debt-based and Equity-based. 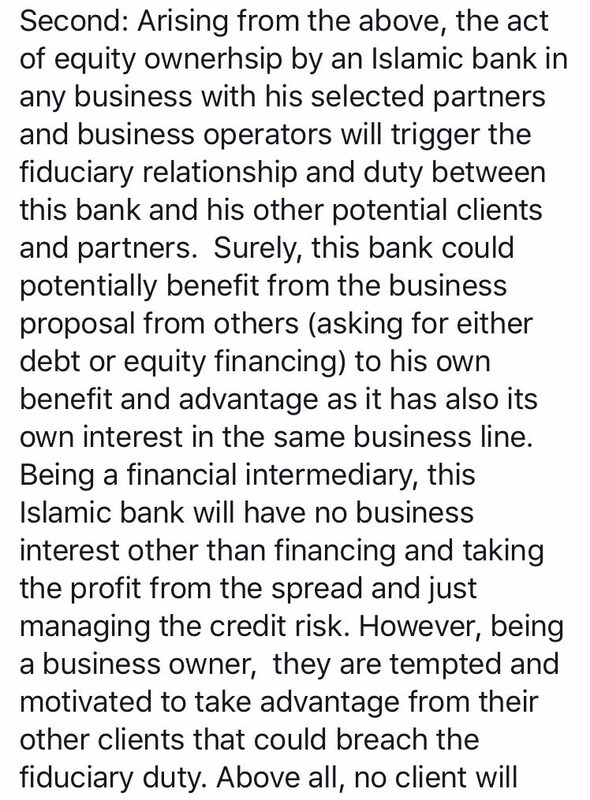 As my earlier postings, I have highlighted that there is nothing wrong with Debt-based structures based on Sale contracts; it does not diminish its “Islamic-ness”. It is just more suitable for Islamic Banks (based on the conventional banking model) in its current form as it deals mostly on CREDIT CONSIDERATIONS and consistent with the intention that Islamic Banks are set-up in the first place. It really deals with familiar types of banking risks! Therefore to move to an Equity-based product structures requires different understanding of the types of risks a Bank will now face. The Shareholders may not be too appreciative to move to a different riskier structures as it will probably not fit their risk profile or given mandate. 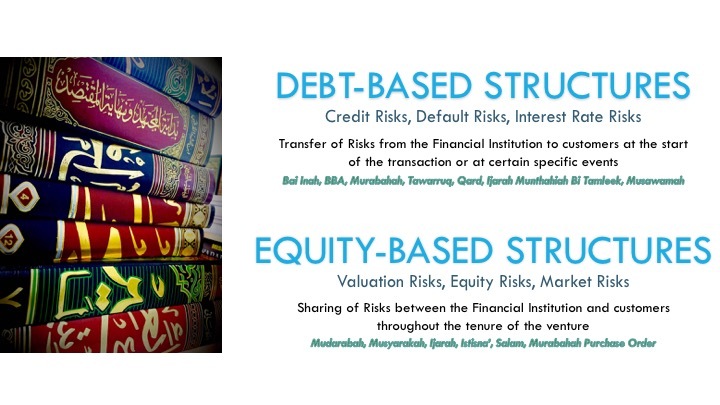 The question is that; is Equity-based intermediation suitable for Islamic Commercial Banks. OK. Let’s address the 5 points that Dr Daud outlined. I totally agree with this. Banks are essentially financial intermediaries, which basically means the Banks are in a business where it provides financial products and services that carries a certain risks which will earn a certain returns on its activities. This is what the shareholders of a bank expects. They are not in the business of “joint venture” or “venture capitalists (VC)”, nor are they angel investors or crowd funders. They expect a certain return on their capital, otherwise they will take their capital elsewhere. If the model is a financial intermediary, there needs to be a clear separation of function between a financier and a business owner. Business owner means involvement by Banks in the customer’s business; the way Banks are currently set up are not this. We in the Bank do not have expertise to get ourselves involved directly into a customer’s business. Let the experts show their expertise. The idea is to let the best qualified experts run their respective shops. For the Banks, the expertise is to manage the credit risks to earn a return. For the customer, the expertise is to run the business as they see fit and to earn a return higher than the amount to pay off the Bank as the financier. Both parties rely on each other for the settlement of the debt created. The traditional banks therefore continue to engage in structures that are “debt-based”. 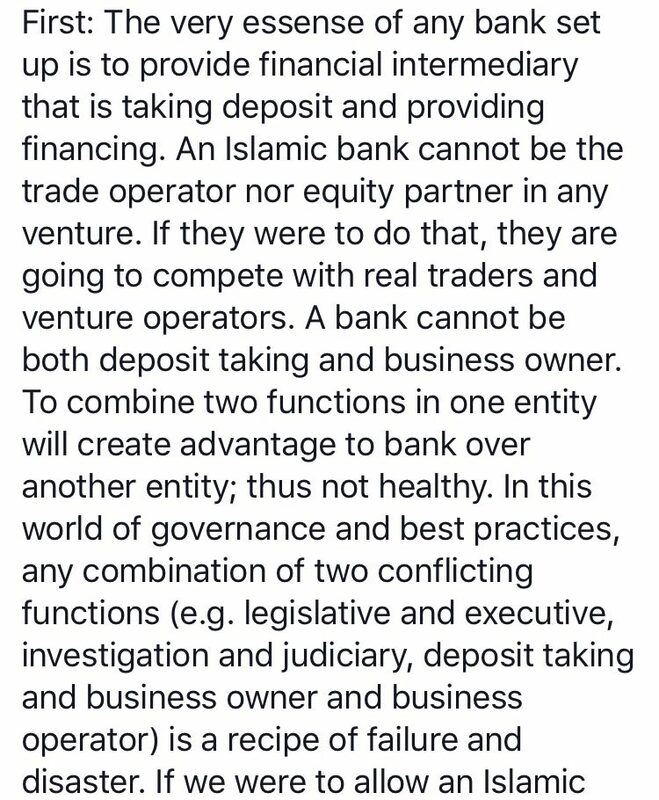 That is why structures such as Murabahah, Bai Inah, BBA, Tawarruq and Ijarah Thumma Al Bai are more acceptable by the Islamic Banks due to their “debt” nature where the issue is just”credit worthiness” , and perhaps collateral. That is all. Again, they are not directly involved in the management of the customer’s business. Getting involved in a customer’s business might be the requirements for the Bank to be comfortable with the risks of “equity participation“. It is because it gives Banks direct control over some aspects of the customer’s business. The Bank will need to protect its interest in the business throughout the investment tenure, and rightly so. But as the Banks now sit in the customer’s management team, the customer may take a different view of this arrangement. Is the market ready to take Bank representatives into their management team, to deliberate business strategies, products, insider secrets and dealings? Is the representative experienced enough to contribute, or will there be suspicion on the Bank’s intention? In a Mudarabah Financing structure, the risk of Capital loss will be 100% and of course the Bank will want to have enough control on the customer’s business. As Dr Daud puts it, it is a suicidal route for the business, unless the Bank provides real expert contribution into this area. Otherwise, the Bank may make decisions that actually impedes the customer’s growth. Issues of conflict of interest may also arise, and the noble objectives to become “partners” may instead be a futile exercise as Banks intents to secure its financial pay-out more while mitigating risks. Again this is common sense. A Bank is set-up in a certain structure, to mitigate its risk via governance, operational effectiveness, audit, board oversight, credit, controls and monitoring. There are many layers of compliance designed to protect the interest of all stakeholders. The business of a Bank is Banking. The Bank hires specific people for specific banking function, to achieve certain objectives which complies with established rules. They are experts hired to do certain functions. Partners. To be effective when a Bank enters directly into the business world, the Bank will need to hire specialists in the business world, not the banking world. I imagine the Bank would need a huge team of specialists, each specialist able to integrate themselves into multiple industries (there are thousands of industries, and subindustries) just to be a useful and contributing member in the customer’s business or industries. They need to be “partners” rather than bankers. Cost to build such a team (and maintain them) would be significantly huge. But Entrepreneurs are Different. On the other hand, business owners are a different breed of people. They are entrepreneurs and problem solvers and people managers in charge of building their business, taking different levels of risks at different period of their growth. The returns are working capital for them. Their end objectives are different : growth and perpetuity, with its profit pay-off can be delayed at the risk of perpetual existence. There is no maturity period or necessary pay-off period. If they take in a partner (for example a bank), they would do so for the purpose of expansion, not for compliance or good governance. The Bank may hire “specialists” but it does not necessarily answer whether the businesses wants “specialists” to be involved in their business in the first place. This point is especially true when the risk type of a product or contract is unconventional. Capital Adequacy Ratio and Basel III talks about Banks having enough financial strength (including Capital) when offering high risk products. And the structures under Mudarabah, Musyarakah and Wakalah Fi Istihmar are definitely higher risks than most contracts. To mitigate such risks, the regulations impose that sufficient capital must be available as an when investment holder request for redemption and withdrawals. Sometimes the higher capital is not deployed immediately whereas failure to do so only adds to the holding costs. Many individuals do not understand this equation. Capital requirements are not the same for conventional banks; under Islamic Banking, it is dependent whether the facility is secured by a collateral or otherwise, and more importantly the structures that is to be introduced. A home financing product secured by property garners only 50% of capital requirements, while other financing are imposed a capital requirement of 100% depending whether the facility is secured by a mortgage or otherwise. At the end of the spectrum, the ratio is increased to up to 400% of capital for structures such as Musyarakah or Mudarabah financing. More important to understand if there are higher requirements for capital ratios. The higher the costs will be incurred as the Bank has to allocate Capital but cannot deploy them elsewhere. This is a cost that needs to be evaluated to ascertain whether such contracts should really continue to be offered at the detriment of the Bank. At least 2 aspect of the Capital will be incurring a cost : 1) when Bank have to borrow 2-3 times the existing customer’s requirements to remain liquid, and 2) the borrowed amount cannot be deployed elsewhere this reducing the potential earnings. I also agree with this. Currently, the accounting standards are based mainly by conventional standards. The accounting treatment is also similar to many aspects of products, but that is still mainly the debt-based structures. Under the PLS structure, the Bank will be involved into the equity-participation space. This will be a standalone development, with products intended to be classified according to its nature. If it is a debt product, it is accounted as per the normal standards. If it is an equity product, the accounting that needs to happen is that similar to the entrepreneur’s own accounting rules. As it is, a lot of questions with regards to how these rules can be superimposed into the Bank’s framework which is set up differently. There is also queries on unsolved bank issues such as market valuation of assets, but perhaps most important is the methodology of how the valuation is done. Only once this is resolved, the accounting of PLS products can be properly evaluated, designed and recorded. The learned Dr Daud knows what he means when he suggested that Islamic Banks have very different mandate to operate whereas the market expects a more “Islamic” model. While I do agree with Dr Daud that PLS do not fit into modern Islamic Banks, I also appreciate the intention of BNM to introduce equity-based product guidelines to the industry to develop and comply with. I am wary of the thought that while Islamic Banks will be ill prepared or unwilling to fully adopt most of the equity-based PLS products, there is really no other incubators of such products other than Banking Institutions. 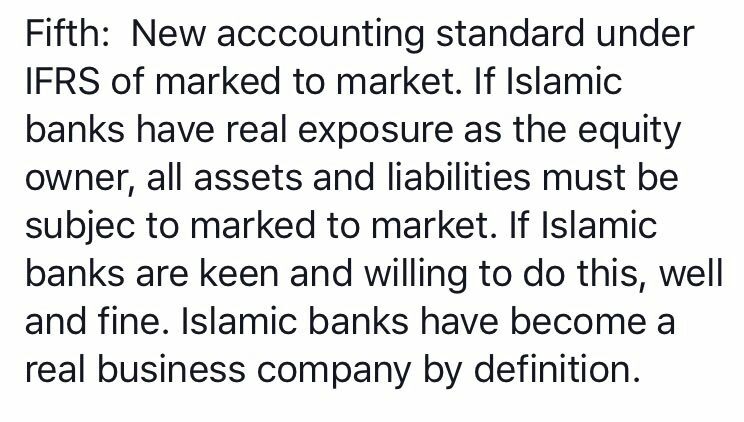 If not the Islamic Banks, then where can these concepts be developed and utilised? Islamic Banks must become product incubators based on the policy documents and the subsequent products to be enhanced/developed for the market. We are in the same boat. We note it is a difficult proposition but I believe we have to start somewhere, and where else would the infrastructure be available except in Banks? Ideally I would have preferred a standalone organisation or financial institution be set-up specifically to cater for such ventures. BNM had the right regulations, but Banks have yet to explore creating “Equity departments” to be fully aligned with such sharing ventures. Having “Equity departments” means a Bank now have the full responsibility of monitoring and assessing the ventures it went into on a full time basis. But none of the Banks have this. 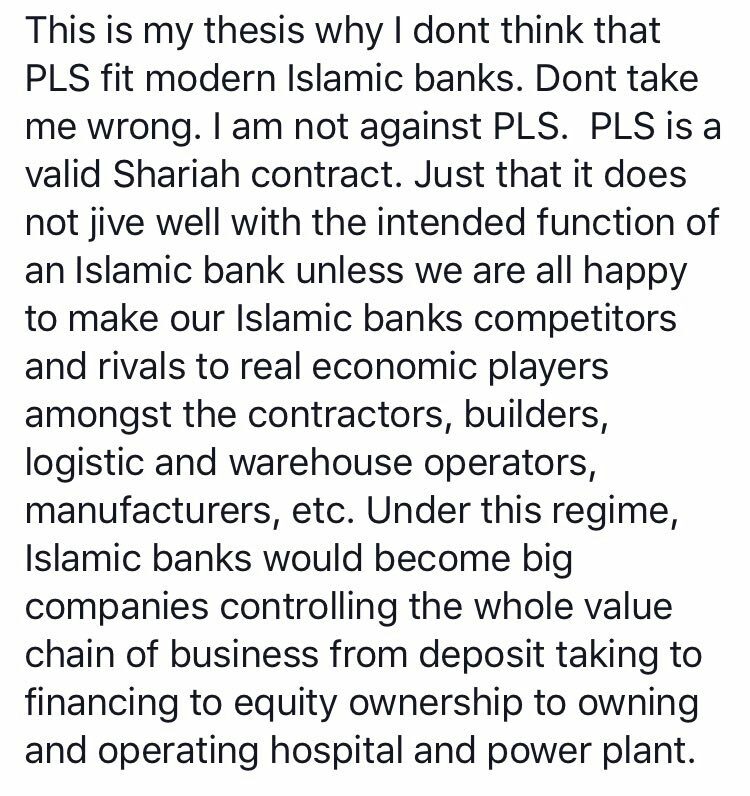 PLS do not fit fully into the Islamic Banks current model. The set-up required should be different to cater for the higher risks offered by PLS. To fully adopt PLS, it requires a revamp of the business model, which is lacking at the moment. There is no working model to benchmark against, and it is not a tested model. Until that happens, debt-based structures are expected to continue with minor inclusion of structures that is partially equity-based financing into the market. It is a long way to go to shift the thinking of risks and risk taking (and its payout) into familiarity of the concept and its potential. I do not believe we are in this space of offering PLS to consumers just yet. Maybe the Value Based Intermediation (VBI) that everyone has been talking about can be the incubating platform for PLS.